The Indianapolis Star recruited Barney Oldfield to write columns about all the happenings leading up to the first Indianapolis 500. Oldfield, who was serving a suspension for competing in events unsactioned by the AAA, would have been an ESPN analyst if there was cable TV in 1911. 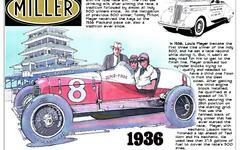 Instead, he pontificated on developments at the Indianapolis Motor Speedway and filed his prognostications. Among them was his prediction that the winning speed average would be 73.5 mph. Not far off the mark, as Ray Harroun's winning average was 74.59 mph. Less accurate was his prediction that the winner would be at least 25 miles or 10 laps ahead of second place. Oldfield felt that 500 miles was way too long a race for a large number of cars or drivers to endure. He also believed it would be too long for the fans as it would require seven hours to run, and they would have travel time back and forth between homes or hotels and the track. Oldfield shares some nuggets that give you a sense of the atmosphere. He talks about restaurants offering "Omelette a la Burman," or "Filet Mignon Bruce-Brown," and the downtown paper boys shouting about extra editions not of train wrecks in faraway places, but the latest developments at the Speedway. Oldfield reports that all the drivers were optimistic of victory, each discussing the advantages of the vastly different types of cars they were driving. Many claimed that if they won the race with its rich $25,000 purse, they would retire from driving or travel to Europe. Published in the May 28, 1911 Indianapolis Star, this is a delightful read.